For the 12 days leading up to Thanksgiving in the U.S., we’re featuring 12 stories from six different countries we work in, as a way of saying, “Thank You” to our supporters, who make our work possible. We hope that you enjoy seeing the difference that you’re making in the lives of poor people around the world, every day. Ibu Marni spent years creating businesses out of her home, ranging from selling groceries to renting out video games, only to watch each one fail due to rising costs, increased competition and complaints from neighbors. Each failure put her deeper into debt, and when her husband lost his job as a construction worker, she struggled to find new ways to support her family. As an optimist with an entrepreneurial spirit, however, she never gave up. In 2009, through Grameen Foundation and its social-enterprise partner, Ruma, she finally found a sustainable business model: selling airtime for mobile phones. With the money she makes, especially now that her husband has found work again, she has been able to pay for her son’s college tuition and to expand their tiny house, so that he no longer has to share a room with his sister. Ibu Marni’s hard work and entrepreneurial spirit have helped her provide a better life for her children. What makes Ibu Marni special is her friendly character, mature attitude and ability to mingle with new people, especially in poor communities. As an older woman, she can easily start a conversation with a group of ladies, who may not be as comfortable talking to a male field officer. She can also approach customers in very poor neighborhoods where strangers are usually not welcome, because people are less suspicious of someone like her. As her technological and financial literacy continue to improve, she plans to create her own cooperative to help provide capital to other poor entrepreneurs, such as coffee vendors. She has learned that by helping others start up small home businesses, they can rise up together from poverty. Ibu Marni has grown from humble beginnings to become a successful entrepreneur who now helps others in her community. When you support Grameen Foundation, you can also give a hand up to poor people around the world and help us break the generational chains of poverty. Our 12 Days of Thanksgiving series stories were collected and edited with the help of Bankers without Borders® volunteer Nicole Neroulias Gupte. 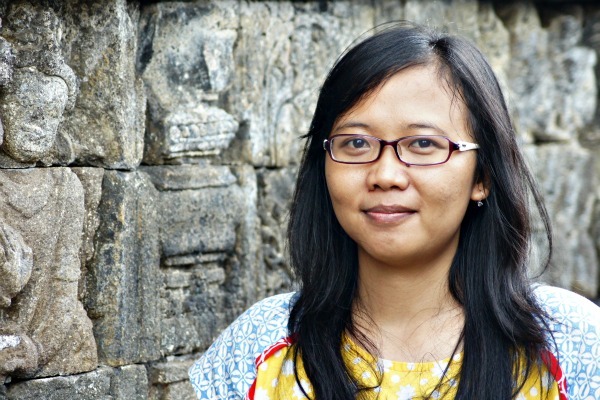 Ellen Sasha, of Makasar, Indonesia, began working for Grameen Foundation as a field officer in March 2010. She had previously worked for the American Red Cross, researching avian-human influenza prevention in Indonesia, and has written a book about conflict and consensus in Bougainville – Papua New Guinea. She is now Operation Manager of a pilot project for a new mobile application that Grameen Foundation is developing for poor entrepreneurs. 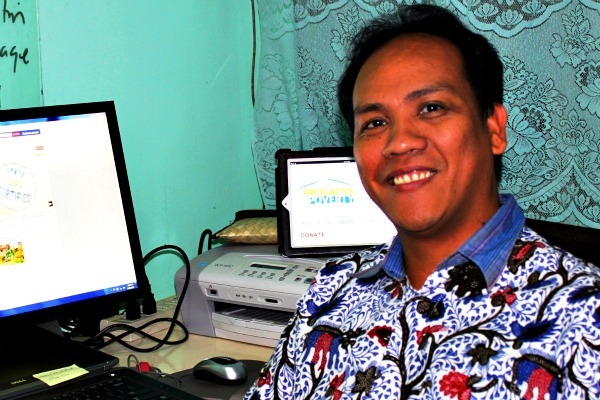 After studying politics and working with several other nonprofit organizations in Indonesia, I was excited about joining Grameen Foundation, where I work to highlight the usefulness of mobile technology for the poor. This mission really caught my interest, since it was really rare finding a non-governmental organization with that focus here in Indonesia; I was eager to do something unique while helping others. Ellen Sasha, Operation Manager for Grameen Foundation in Indonesia, is regularly inspired by her interactions with the poor women she meets. But working in the field is not as easy reading theories in books. A major challenge involves bridging the gaps between the diverse range of people we that we meet every day. It’s not just the differences between larger communities, but the differences in small groups that can be striking as well. Before they will consider using the products that we offer, we must earn their trust. Only then can we demonstrate the value of our product from their perspective. The best part of my job is really helping people at the “bottom of pyramid” by directly engaging with poor women and other people in the community. I enjoy learning directly from our clients how mobile technology can really fit and be useful in their struggling communities. I love chatting with our beneficiaries, closing the distance between my life as an educated woman who works in an office and their lives as poor women who work in the home. Some of them see me as a family member now and feel comfortable confiding in me about all sorts of problems in their lives. In turn, this helps me understand their situation even more deeply, revise my theories and gain new insights for projects that we’re working on. By understanding and addressing their thoughts and concerns about new things, we can really improve these women’s lives. Their humbleness, honest attitude, high integrity and caring are inspirational. My work with them doesn’t feel like fulfilling an obligation; instead, it feels like a kind of hobby – something I do that gives me happiness and pleasure. You can help us reach more poor women in Indonesia – and around the world – by supporting Grameen Foundation today. Santosh Daniel, of Mumbai, India joined Grameen Foundation February 2010 as a Project Manager leading oure microsavings initiative. 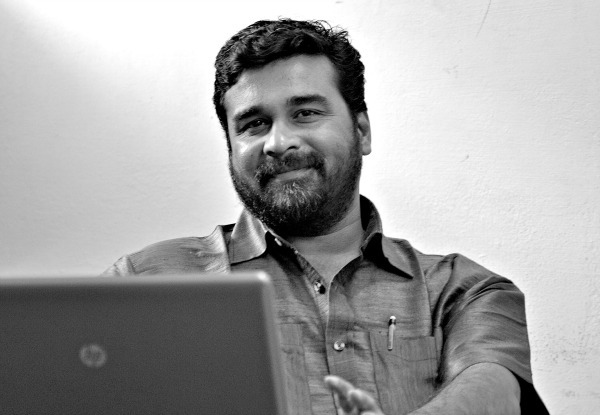 Prior to joining Grameen, Santosh had sixteen years of experience with ICICI bank, Kotak Mahindra Bank and ACCION, specializing in lending to urban poor. I wanted to work for Grameen Foundation to help lend credibility to this microfinance model being used successfully to reach the poor – to learn and overcome the immense challenges. It’s creative work, and it’s a very uplifting feeling to witness the impact of our actions reflected through the smiles the clients we serve. I enjoy being a part of a very active and vibrant organization in which is defining and influencing the international development landscape in India. Santosh regularly meets with savings groups in the villages, helping connect poor women to savings accounts through a mobile phone. Grameen Foundation supports Cashpor, a microsavings program in partnership with ICICI Bank, to use mobile phones to enable poor, isolated customers to withdraw and deposit their money without having to travel to a bank. We operate in seven districts in Utter Pradesh, with about 80,000 clients. Until now, these women didn’t have access to a bank account, because they live in villages where there are no bank branches. Furthermore, they don’t make enough money to open conventional accounts, which require minimum balances and deposit/withdrawal amounts. In the past, if these women had some extra money, they would keep it around the house or bury it. Otherwise, it would be spent on non-essential and impulse purchases, or taken by their children, or even eaten by rats. They didn’t have any options for an organized way of saving money. This account allows them to make very small deposits – even deposits of 20 rupees (about $0.40) are allowed – from their mobile phones, which are available for less than $10 in India. Most of the women are illiterate, so they are assisted by the center manager, who also collects and distributes the money at the end of the weekly meeting. Work requires me to be in the field much of the time, visiting savings groups meetings about six times a month. The most challenging part of the job is patiently working with different stakeholders with divergent interests towards a common goal. Not all the factors influencing the project are controllable, but how close we can come to understanding and responding to the uncontrollable effectively defines our success. With our technology and information-collecting expertise, we’re helping take this mobile-enabled savings to the rural villages where these women can enroll themselves through the mobile phone and start saving. Many of them are illiterate, so we also teach them financial literacy to help them understand the text messages. We are also getting them in the habit of saving money, which allows them to make a plan. Our initiative has brought them closer to their dreams of being able to save, hope, live and love. Help even more poor women reach their dreams through access to savings accounts and other services by supporting Grameen Foundation today. Rajkumari Buddhu lives in Kaurouta, a village in Uttar Pradesh, in northern India. She shares a small mud-thatched hut with her husband, four children, two daughters-in-law and grandchildren. The family’s livelihood comes from weaving clothes and selling them at the local market, Rajkumari spins her wheel and makes small spindles of different-sized threads from larger spindles, forming the spools used in the weaving process. Here is her story, as told to local Grameen Foundation staff. Rajkumari has always wanted an organized way to save the small amount of money that, though discipline, she had left over every week, but without access to a savings facility, she often spent it. When Grameen Foundation microfinance partner Cashpor introduced a savings program in her area in July 2011, Rajkumari quickly enrolled. Now she has a disciplined and reliable way of saving. 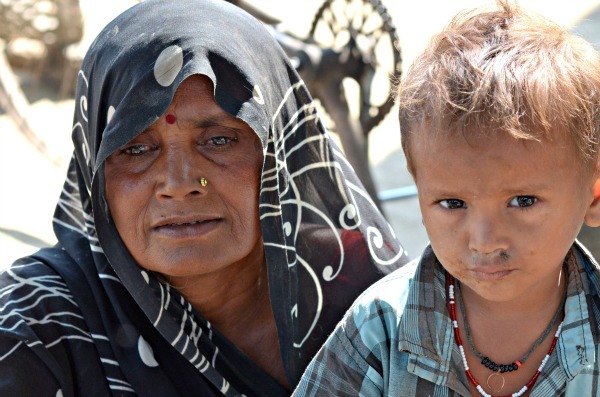 Rajkumari (shown here with her grandson) earns a living weaving thread, and has been able to help herself – and her family – in times of emergency, thanks to her savings account provided by Cashpor, helped by Grameen Foundation. Rajkumari became sick with severe pneumonia and had to stay in the hospital. After the first few days of treatment, paid for by her husband and sons, the hospital insisted on an additional 4,000 rupees (about $75). Her family’s resources had totally dried up, but she realized that she had some money left in her Cashpor savings account. With the IV still attached to her wrist, she traveled on her son’s bicycle to the nearest Cashpor branch. It was almost 6 p.m., but to her great relief, she saw the center manager’s motorcycle still parked outside. She immediately went over to him and withdrew the entire 3,200 rupees in her account, then managed to borrow the balance from her neighbor and pay the hospital to continue her treatment. Rajkumari’s daughter-in-law, during the third trimester of her pregnancy, realized that her baby had stopped moving. She was rushed to the hospital and told that she needed an operation to save the baby and herself. Rajkumari’s family was not prepared for this sudden expense, but the money in her savings account again came to the rescue. After seeing the birth of her healthy granddaughter, Rajkumari felt proud that her small savings account helped save the lives of her daughter-in-law and her granddaughter. A less dramatic, but still meaningful, occasion happened when her twin daughters wanted to participate in the state-level Khabaddi athletic championship in Delhi, but they needed money to fund the trip. Rajkumari managed to help them with her small savings, and she now proudly displays the trophy and the certificate that her children won in the championship. Though the Hindi meaning of her name is “princess,” life has never treated Rajkumari as one. Now, with the help of Grameen Foundation and Cashpor’s savings program, she is the queen of the house – managing household finances, helping with the family business and helping the family lift themselves out of poverty. Access to savings has helped usher in new hope to face the hardship and give wings to her aspirations. You can help more families like Rajkumari’s lift themselves out of poverty when you support Grameen Foundation today. Cristopher Lomboy lives in Los Banos, in the Philippine province of Laguna. He joined Grameen Foundation in November 2009 as its poverty measurement specialist in Asia. One of our exciting initiatives in Asia is the microsavings initiative in collaboration with CARD Bank in the Philippines, which reaches around 600,000 clients. Its goal is to encourage more poor people, especially those living on $1.25 or less a day, to have access to formal savings services. The program allows them to pool their money as a group and then open one account for each member of the group. Cris strives to put life-changing tools – like savings accounts – in the hands of the poor, and to help other pro-poor organizations reach more poor people, more effectively. My role is to help the project measure the poverty levels of the clients, then use this information to find out if we are reaching the poorer people. If not, we develop approaches to reach those clients. What makes my job rewarding is the opportunity to become a thought and practice leader in poverty measurement, and to support “blended performance reporting” – meaning that we look at both financial sustainability and social impact. Also, being able to learn about poverty alleviation efforts in different Asian countries enriches my own approach to helping influence pro-poor organizations’ initiatives to help the poor. One of the challenges of my job involves reaching out and sharing our rich experience and tools with more pro-poor organizations. The magnitude of poverty is great and there is a real need quickly exchange knowledge and stories between practitioners, to help improve their practice. We also collaborate with other organizations, such as the Ford Foundation, to provide technical support for poverty measurement data. Our goal is to increase our direct outreach to poorer clients. There are many people who do small jobs, like selling vegetables and seasonal manual labor, who are most vulnerable to crisis. If they can at least save some money for an emergency or life event in their families, then reduce the risk they face, and break the cycle of poverty for themselves and their families. You can help us connect even more poor people to savings accounts when you support Grameen Foundation today. Elsa Ligua, 41, of San Pablo City, in the Philippine province of Laguna, is married, with four children. She’s now able to save money through a microsavings program offered by CARD Bank, a microfinance institution that is a long-time partner of Grameen Foundation. She shared her story with Grameen Foundation’s Cristopher Lomboy. Elsa Ligua’s husband has a shoe-repair stall near the public market. She helps add to the family income by selling food. All four of their children go to school, and she is proud that the eldest also works as a supermarket clerk. She joined the microsavings program at CARD Bank, which Grameen Foundation helped develop, to help save for her children’s college tuition. Both she and her husband had to drop out of school, so they want to make sure that their children become educated and have better opportunities in life. Every day, a CARD Bank savings officer visits their home and collects about 50 cents from Elsa and other members of her savings group. On good days, she deposits even more money. Her goal is to save about $200 by June 2013, so that she can pay the tuition fees. She disciplines herself not to withdraw her savings and instead lets it grow over time until she needs it. 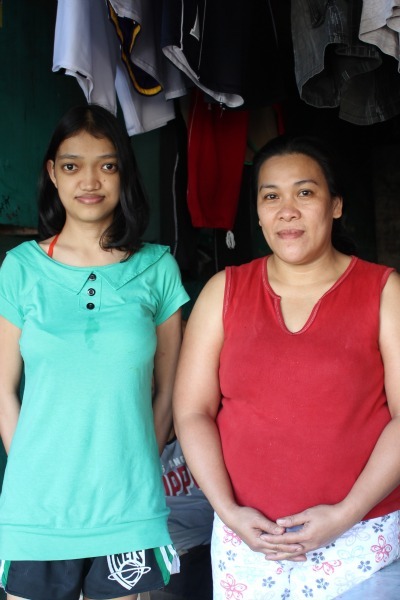 Elsa (right) and her niece Rose Anne are now able to save for emergencies and other future events, thanks to the savings account provided to them by CARD Bank, with the help of Grameen Foundation. Before the savings program, she kept spare money around the house, but ended up spending it. But now, with her money in a safe and remote location, she’s not tempted to use her savings immediately, she says. You can help more people like Elsa achieve their savings goals – and eventually escape poverty – when you support Grameen Foundation today. Lori Ospina began working for Grameen Foundation as an intern in the Washington D.C. headquarters in 2009. She is now a program in Colombia, Grameen Foundation’s newest branch office, working with local partners and farmers trained and paid to be Community Knowledge Workers (CKWs) to use mobile phones to bring information and financial services to isolated farmers. When we began working with the farmers, I was really nervous that they wouldn’t like the program or that our incentives wouldn’t be enough to get them on board. However, the feedback has all been incredibly positive. One of our CKWs told me that this has become her “hobby” – going out and talking to the farmers about their problems and being able to help them. Another CKW told me that people now show up at his farm to get registered, and farmers call him with their questions. All of them were very willing to adopt it – I was blown away. 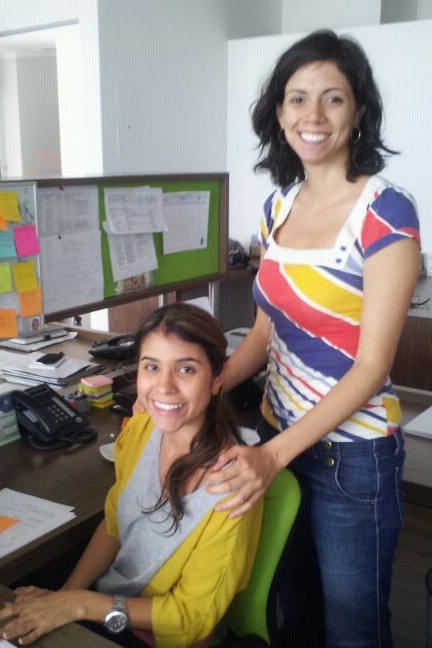 Lori Ospina (right) with Grameen Foundation’s Colombia Office Adminstrator, Luz. She’s inspired by meeting so many hard-working rural farmers, especially those who continue persevere amidst a dangerous atmosphere of conflict and violence. Many farmers know the basics already, but they’re excited about the new information. The top two things they ask about are pest/disease control and crop diversification, because most of them only grow a single crop on their farms, but they would like to grow other things too. Our system updates information constantly, so we’re able to see what they’re asking, address that in real-time and add improvements. We’re helping them qualify for Fairtrade International certification, which will secure minimum prices and sustainable growing practices for them. We’re also exploring how we might be able to incorporate a mobile payment program, as well as address financial literacy. The best part of my job is going deep into rural communities and seeing other ways of life. I’m able to meet all types of inspiring people – farmers, extension agents, families and a lot of hardworking people who deliver local services to these rural communities. The hardest part is that we all care so much about our work, but often don’t have all the resources needed, so work can become a little all-consuming at times. There’s also a safety issue, unfortunately. Tibu, one of our program areas, is a conflict zone that’s been the location of a guerilla headquarters. We’re not allowed to go there because it’s so dangerous, so we have to do a lot of our work from the cooperative – and even getting out there is a trip. It’s only about 120 kilometers from the airport, but the road conditions are so bad that it ends up taking three to six hours, and you see military tanks and safety checks the entire way. There’s a bridge that we typically travel over, but recently we had to take a ferry across because the guerillas had destroyed it. I interviewed one of our CKWs after our training and he talked about it with such nonchalance, telling me that even if you don’t want to be involved with the conflict, you indirectly are. He and his father built boats, and guerillas would buy them. Some of the farmers used to grow coca, but now they’ve switched to food crops to try to get away from the drug trade. We’re still growing, testing and learning along the way. We currently reach about 350 farmers through a grassroots cocoa-growing cooperative and a large export company that works with banana and plantain growers. Eventually, we plan to expand to other crops and regions, and to take this model to other parts of Latin America. It’s very exciting! You can help us connect more farmers in Colombia with life-changing information about crops and livestock by supporting Grameen Foundation today. Eliseo Gonzalez Angel – known as Angel – is a middle-aged farmer in Colombia who grows cacao, the main ingredient in making chocolate. 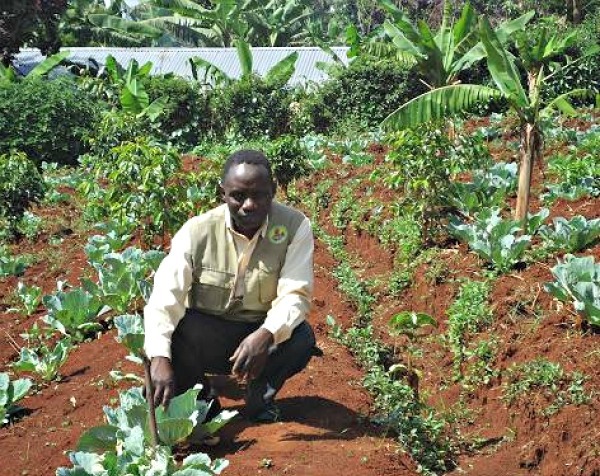 With the help of a Grameen Foundation Community Knowledge Worker (CKW), Angel has been able to get important tips on how to take care of his crops. Grameen Foundation recently expanded our CKW work from Uganda to Colombia, using what we’ve learned previously, as well as tailoring our efforts to the local needs. Squirrels don’t pester Angel anymore, thanks to advice he got through Grameen Foundation’s efforts in Colombia. In July, Angel connected with his local CKW, trained by Grameen Foundation and equipped with a smartphone that can access a range of information about crop management, market prices, certification requirements and diversification. 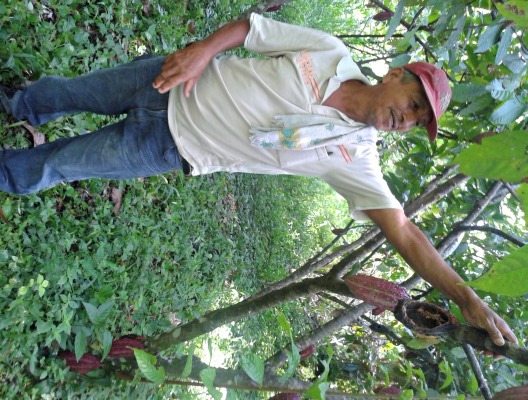 The middle-aged cocoa grower is now on track as a member of the Asocati agricultural cooperative in Tibu to become certified by Fairtrade International. Farmers who receive such certification use sustainable growing techniques – including approved methods for controlling squirrels and other pests – and typically get a better price for their harvest. And chocolate lovers appreciate that Angel’s cacao is safe from pesky squirrels! Angel examines his latest cacao crops. Angel’s farm is in Campo Dos in the Norte Santander Region, an area with a long history of guerilla violence, which adds to the challenges faced by farmers. Farmers often worry about protecting their families and property, as well as transporting their crops safely to market and handling the money they earn. The 40 km journey for Angel into the city already takes four hours, due to poor road conditions, and he tries to hitchhike to avoid the additional transportation costs for the weekly trip. As Grameen Foundation’s work in Colombia grows, Angel hopes to take advantage of mobile banking services and small loans, as well. With a loan from family members and advice from his CKW, he has expanded to selling chickens and eggs as an additional income source. He earns about $100 a month, which is still $30 less than his expenses. As we expand our work in Colombia and Latin America, you can join us in empowering even more farmers when you support Grameen Foundation today. Our 12 days of Thanksgiving series stories were collected and edited with the help of Bankers without Borders volunteer Nicole Neroulias Gupte. Charles Chebet, 45, of Uganda’s northeast Kapchorwa district, was selected by his peers to become one of Grameen Foundation’s trained Community Knowledge Workers (CKWs) in 2010. With the training and smartphone provided by Grameen Foundation, he has been able to tremendously improve his coffee harvest and connect hundreds of other farmers to advice, technical assistance and equipment loans. Here is his story, from his perspective , as shared with Bankers without Borders volunteer® Nicole Neroulias Gupte. Before working as a CKW with Grameen Foundation, I was a farmer and I did some small business where I live. Grameen Foundation has now expanded my agriculture experience. By using the phone, I get advice to treat my animals and grow my foods. And because I am a CKW, I also get a little money for helping other farmers. I am supposed to visit more than 100 farmers every month, but I always do more. As a rural farmer and CKW, not only does Charles learn new farming techniques though his mobile phone, but he is also able to share them with hundreds of other farmers nearby. I have bought some equipment, which helps me have a bigger harvest and teach other farmers about these practices. We want to help farmers get better fertilizers, chemicals, seeds and tools. Maybe a shop can open here that sells those things. Maybe I can do that in the future. Now I am growing coffee and bananas, cabbage and vegetables. I also have sheep, goats, cows and pigs. I learn many things by using the phone. We had a banana disease, but we learned that we can use ash mixed with urine to treat the plants. So now we don’t have that problem anymore. We are six people in my house: me, my wife and four children. My 23-year-old daughter has finished university and is working for an agricultural organization to develop some programs for small households. My 18-year-old son is studying agriculture. My 15-year-old daughter is sitting for exams. My 14-year-old son wants to become a priest, and is going to join a seminary. I like my work, and I like the farmers that I’m helping in my country. Grameen Foundation is good. Thanks to your support, Charles and hundreds of other rural farmers near him are able to grow more crops and better support their families. You can help empower more rural farmers in Uganda when you support Grameen Foundation today. 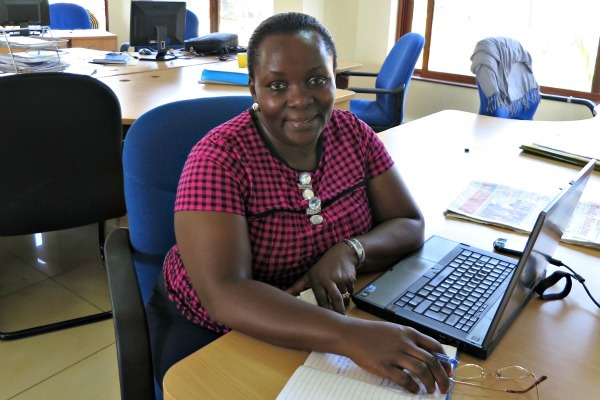 Sarah Mugisha, of Masaka, Uganda, joined Grameen Foundation in January 2009 to help recruit, train and oversee Community Knowledge Workers (CKWs). She is now a network and training manager, overseeing a team of 14 people supporting a network of more than 900 CKWs in 30 districts. This network is expected to grow to 1,200 CKWs in 36 districts by next year. After 10 years of working with organizations to alleviate rural poverty in Africa, I joined Grameen Foundation because it addressed the missing link: empowering small farmers, who make up 80 percent of Uganda’s population, to improve their livelihoods through effective and scalable innovation. By equipping a local intermediary with up-to-date information and cutting-edge technology, we offer a rural development solution that broadens the knowledge base of poor households. Our smartphones enable farmers to access information on planting, post-harvest handling and fair market prices. We also have information on animal care, weather, service providers and all sorts of advice to help them make profitable decisions. This technology has given rural farmers a ray of hope that they have not been forgotten, and that someone is seriously thinking about their challenges. Initially, there were some limitations with using the phone in rural areas, but we’ve found ways to overcome them. One of the major problems we still contend with is sporadic network connectivity. We’ve made much of the information we need permanently available on the phone, so it can be accessed without a network connection. But when the CKWs are submitting surveys or getting more updates, they need to find a place where connectivity is good. The best part of my job is training CKWs and making a difference in people’s lives. When I see the radiant glow in a farmer’s eyes because a piece of information has helped them, that makes my day. Organizations are now approaching our CKWs because of the skills they have acquired, and many want to help them do community mobilization and promote different activities. We are advising them on whom to engage with and whom to be cautious with. We would like to have a 50-50 mix of male and female CKWs, but it’s difficult, because not many women out there are literate enough to join our program. In Uganda, we have more than 50 ethnic groups and languages, and we can’t translate everything, so the content on the phones is in English. We need someone who is educated enough to be able to look at the content, understand it and then translate it for the farmer. That’s what limits the participation of women. The sky is the limit for what we can make available to the unreached masses, via the smartphone. That said, we always keep in mind that though we can still reach out and offer support remotely through technology, it can never replace the impact of human touch. Thanks to your support, our CKWs have helped more than 100,000 farmers in Uganda. Help us reach even more by supporting Grameen Foundation today.